Have you been enjoying the content so far? Do you think it would be great if I had MORE? Well, I do. Time is the single biggest factor in my ability to get more and more words on the page. And that time has to be divided between the writing and the editing, and the blogging, and the posting, and the networking, and the interviews, and the promotional stuff... and that's not even counting the family and job. The other big factor is money. Money for the whole food and clothes thing, mostly. People don't seem to appreciate it when I walk around naked in public. But money also to let my poor little posts get a bit of extra notice on social media. The metrics keep making it harder for the times when I need to post the "buy me" stuff without forking over some dough. Also, money to get a small table at some conventions would make a huge difference... and there could even be some cosplay going on... Just saying. The point is, as much as I would love for my stuff to be available to people in return for a little love and adoration, the utility company doesn't really accept "likes" as a way to keep the power on so I can use my laptop. So I spend a big chunk of my already stretched time, getting money, so I can keep writing. But you can help! 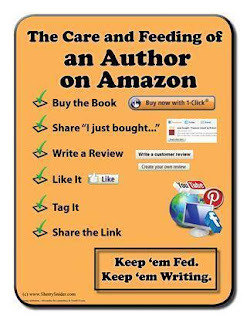 There are two big ways to support your fav authors and other artists. Please, don't forget the reviews part. It doesn't have to be a big thing - just clicky on the stars and write "awesome" or something. But the fact that the review exists makes a huge difference in how webstores treat that author and book. A few seconds of your time can be life-changing for an author - when else do you get that kind of power, eh? It's like subscribing to your favorite author. Or artist. Or movie maker. It's like a monthly plan version of kickstarter. And it keeps the artists out of the po' house while they continue to make great stuff for you and your world.